Wood Metal Rubber Leather Ceramics Gemstones Rocks & Minerals Carbon Fiber Fiberglass PVC and Most Plastics. Tips: When bonding two very smooth surfaces together, it is advisable to make the surfaces abrasive so they have more holding strength. ✅ PREMIUM ETHYL CYANOACRYLATE SUPER GLUE - LAB TESTED FOR OPTIMAL PERFORMANCE: High performance industrial grade adhesive. The Medium CA is great to have around in the house as a "general purpose" repair glue. ✅ EXTRA SUPPLIES: (2) applicator caps, (1) clog-free stopper, and a bag of micro-tips for precision. The extra applicator caps are in case of future clogs, the clog-free stopper has a tiny pin to prevent clogs, and micro-tips provide the perfect extension for tiny cracks. ✅ "MULTI-PURPOSE" ARTS, CRAFT & HOBBY ADHESIVE: Great for gluing RC car tires, acrylic nails, model airplanes, wooden instruments, wood turning finish, pen making, lapidary applications to treat cracked stones, and bonding close-fitting parts. ✅ PROPERTIES: Viscosity: 150 cPs (meaning the thickness of the liquid is similar to that of motor oil). Penetrating abilities of up to 0.006" in size. ✅ LONG LASTING SUPERIOR SHELF LIFE: When well kept, our product can last several years in a cold environment. Just make sure to store the bottle under 40°F before AND after use to QUALIFY FOR OUR 20 month shelf life warranty. If product does not last, we will replace that bottle free of charge. 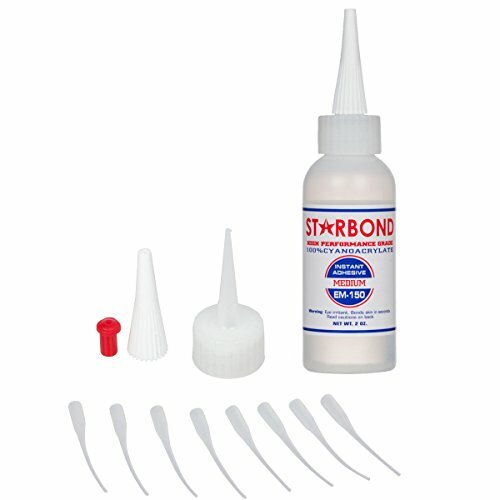 If you have any questions about this product by Starbond, contact us by completing and submitting the form below. If you are looking for a specif part number, please include it with your message.